Contour has now surrounded you with an even more personalized experience — adding Pandora and Music Choice Plus right on your TV. This perfect complement to Contour provides even more entertainment by incorporating the music you love into the overall personalized experience. Pandora recognizes you have a unique relationship with your music, so it seeks to deliver the optimal radio experience. Enter a favorite artist, track, comedian or genre and Pandora will create a personalized station that plays their music and more like it. Rate tracks by giving thumbs up and thumbs down feedback and you can add variety to further refine your stations, discover new music and help Pandora play only the music you love. You can launch Pandora from the Contour guide’s Interactive Services menu to link to your existing Pandora account or create a new one through a one-time activation process. Up to 8 users can link to an account to enjoy their favorite music or comedy tracks. Once you are familiar with the customization of stations and track management, you will see the changes you implemented in Contour reflected in Pandora on other devices for a seamless experience. To activate Pandora, begin at the Interactive Services Menu in the card on the left. Use the UP or DOWN arrow to highlight Pandora and press SELECT or RIGHT arrow. The focus will shift to the center card. Press SELECT on Launch. This will launch the Pandora application. Write down the activation code displayed on screen. On your computer or a mobile device, go to www.pandora.com/cox and enter the activation code. Follow the prompts to create a new account, or log in with an existing account. Once your account is verified on the computer, Contour will link your Pandora service with the Pandora account. Once the activation has been completed, return to your Contour receiver and press the A-Launch Pandora button or start Pandora from the Interactive Services Menu. NOTE: Each user in your household will need to complete the activation process separately if they wish to link their own personal Pandora account with the Contour receiver. While this is not required, it does give you a more personalized experience. To listen to music on Pandora, you will need to create personalized stations. You may have already created Pandora stations on the web or other devices, and if so, these stations will automatically appear on Pandora on Contour. You can also create stations right on your TV through your Contour receiver, and they will also appear on other devices you use to access Pandora. Use the DOWN arrow to highlight New Station and press SELECT or RIGHT arrow. The focus will move to the keyboard in the center card. Use the UP, DOWN, LEFT, RIGHT arrows and the SELECT button to enter characters into the search box. As soon as you enter characters into the search box, results will begin to appear in the Results Card on the right. Continue typing until you see results. Press the RIGHT arrow. The focus and highlight bar will move to the Results Card. Depending on your search, you may see artists, composers, or genres that match the search information you just entered. Use the UP and DOWN arrows to move the highlight bar to the station. Press the SELECT button. A station will be created and added to your Pandora station list. Once you have created stations, you are just a click away from personalized radio. 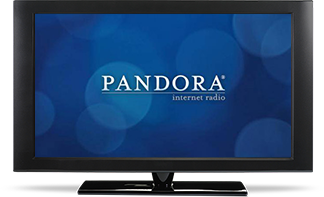 To listen to music on your TV, begin at the Pandora application. Use the UP or DOWN arrow to highlight My Stations and press SELECT or RIGHT arrow. The highlight bar will move to Stations card. Use the UP or DOWN arrow to highlight the station and press SELECT. The selected station will begin playing tracks. Select SHUFFLE at the top of your station list to hear a mix of music from all stations. While the track is playing, use PAUSE or PLAY buttons to pause or play the track. Use FFWD button to skip to the next track. Giving a "thumbs up" tells Pandora "you like this track" and helps to bring in more tracks like it to your station. Clicking "thumbs down" tells Pandora not to play that track. To give a thumbs up to a track, press the A button on the remote control. To give thumbs down to a track, press the B button on the remote control. A thumbs up or down icon will appear in the track description displayed at the top of the screen. Use the DOWN arrow to highlight My Stations and press SELECT or RIGHT arrow. The focus will move to the keyboard in the center card. Use the UP or DOWN arrow to highlight a station you want to delete. Press the A button to delete the highlighted station. A dialog will ask you to confirm if you really wanted to delete the station. Press the A button to confirm the deletion. WARNING: Deleting a Pandora station from your TV will also delete that station on other devices. Press STOP to return to the Pandora Menu. Press LEFT arrow until you return to the last live television channel you were watching. Press LIVE or LAST to return to the last live television channel you were watching. Press CHANNEL UP or CHANNEL DOWN to tune to the next channel up or down on live television. Enter a channel number on the keypad (0-9) to tune directly to that live television channel. Press FAV to call up the first channel in your Favorite Channels list. To sign out, start at the Interactive Services Menu. Use the UP or DOWN arrow to highlight Sign Out and press SELECT. A warning dialog will appear on the screen. Press the A button or SELECT to proceed. You will be signed out of Pandora. Already available on Contour TV with uninterrupted music channels and hundreds of videos available On DEMAND, the Music Choice application allows you to watch a play list of favorite music videos offered by Music Choice, on TV through your Contour receiver. Search for a specific song, keyword, genre or artist and enjoy related videos on a non-stop playback for up to 14 videos. Access music videos through the On DEMAND menu or the interactive application. Browse and search for music videos by track title, artist or genre. 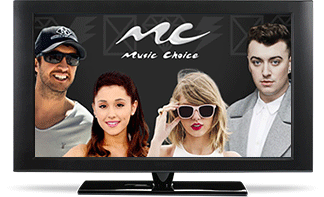 The Music Choice application allows you to watch your favorite music videos and Original shows offered by Music Choice On DEMAND, on your TV through your Contour receiver. Plus, you can watch up to 14 videos back-to-back and more. You also can browse and search for music videos by track title, artist or genre. Press the menu button on your Cox remote control. With the arrow buttons surrounding the select button, scroll down to the Interactive Services and press SELECT. Scroll down to Music Choice and press the RIGHT arrow button. Press SELECT on Launch. This will launch the Music Choice application. Once Music Choice has launched, use the UP or DOWN arrows to browse through music genres such as Latino, Pop, Rock, Country and more. Press the RIGHT arrow to bring highlight to the center card for the music genre you want to hear. The center card displays the available categories within a music genre such as Hit List, All Artist, New videos, and more. The right card displays the music videos. Use the UP or DOWN arrow to browse through the available music videos. Once you have found a music video to watch, press SELECT. The music video will begin playing. Once the music video stops playing, the next video will start playing automatically. You can watch up to 14 videos play automatically back-to-back from a playlist of videos. Like most On DEMAND programs, you can skip forward and backward through the video using the play, pause, stop, rewind and fast forward buttons on the remote control. You can also use the Instant Replay button to jump backward in the program seven seconds. Press the LIVE button to return to the last live television channel you were watching. Never miss the action on live TV. Find movies and TV shows airing right now with the Contour Program Guide.